Ready to build a custom home in Greensboro? Let's start with the kitchen. Ready to build a custom home in Greensboro? Let's start with the kitchen. As the old saying goes, the quickest way to the heart is through the stomach. The same is true of homes. The kitchen is the heart of every home, where family and friends gather and break bread together, enjoying food and fellowship. If you plan to build a custom home in Greensboro, it’s wise to spend some extra time designing your kitchen. Here are some tips to help you design the custom kitchen of your dreams. The ultimate goal is a beautiful kitchen that is also functional. Think about how you will use your kitchen. Do you enjoy cooking and take your time creating culinary masterpieces? Or do you cook meals as quickly as possible to get everyone fed in the midst of their busy schedules? The ambitious chef should incorporate food preparation surfaces and cooking appliances that make it convenient and fun to cook and bake, such as a built-in butcher block counter and convection oven. The reluctant chef should focus on making cooking easy and fast, incorporating a built-in microwave and plenty of counter space for small specialty appliances, such as crock pots, instant pots, and egg boilers. Choose surfaces that are beautiful and durable, such as granite, quartz, or stainless steel. Large farm sinks are convenient and stylish. Backsplash patterns give you a chance to incorporate your own unique style and color preferences while protecting the drywall from splatter. Designing a home that reflects your own personality is one of the biggest reasons to build a custom home in Greensboro in the first place. Storage is important in a kitchen, and cabinetry is the most common type. The color and style of the cabinets in your kitchen set the tone for the room. Consider carefully whether you want a light or dark wood stain, painted cabinets, or glass doors. The hardware you choose can make cabinets look more ornate and antique, or more sleek and modern. Your appliance finish should complement the cabinet color as well, whether you choose stainless steel, white, black, copper, or any of the bright retro-colored appliances that are gaining popularity. A complementary color pallet, as well as color contrast, is important in any room. Kitchens are exposed to a lot of foot traffic, as well as food spills and moisture. Beautiful floors can also be durable, and the latest floor materials achieve this concept. Wood floors are the least resistant to moisture, and are being replaced with other materials, such as vinyl and tile. Tile is even losing popularity as the grout can be difficult to keep clean. Luxury vinyl that mimics wood is resistant to moisture and scratching and is in general much tougher than wood or even laminate. It is also a popular choice for bathroom floors for the same positive qualities. 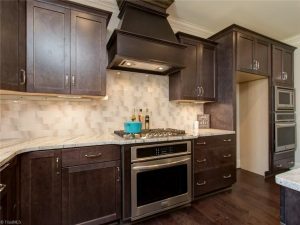 Designing your custom kitchen is easy with the help of expert home designers and builders on the Don Mills team. Convey your wants and needs for your dream home and Don Mills will make it come to life. Schedule a consultation to build a custom home in Greensboro: (336) 362-1777.